조선시대 백자 태항아리로서 외항아리는 전체 높이 30.9㎝, 아가리 지름 21.4㎝, 밑지름 14.1㎝이고, 내항아리는 전체 높이 19.2㎝, 아가리 지름 10.6㎝, 밑지름 8.3㎝이며, 태지석(胎誌石)은 26.6㎝×26.7㎝×4.6㎝이다. 태항아리란 왕실의 왕자나 왕녀가 태어났을 때 태를 담는 항아리를 말하며, 이것과 그 주인공의 이름, 생년월일을 기록한 태지석을 함께 묻는다. 외항아리는 아가리가 넓으며 밖으로 살짝 말려있다. 짧은 목에 위쪽이 넓고 아래로 내려갈수록 좁아지는 모양을 하고있다. 어깨의 4곳에는 고리를 달았으며, 냄비 뚜껑같이 생긴 뚜껑의 꼭지에 나있는 4개의 구멍과 연결하여 고정하도록 되어있다. 백자 유약으로 전면을 고르게 칠하였으며 광택이 있다. 내항아리는 외항아리와 비슷한 모양으로 이루어져 있으며, 크기가 조금 더 작다. 태지석은 정사각형 모양의 검은 돌로, 앞·뒷면에 새겨진 글로 보아 1643년에 제작된 태항아리로 왕자 아지(阿只)의 태를 담은 것으로 1639년에 태어나 1643년에 태를 묻었음을 알 수 있다. 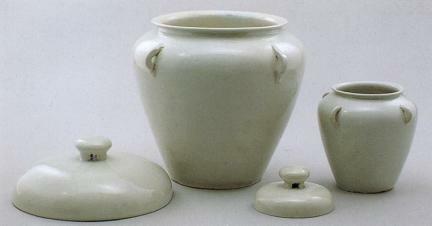 This white porcelain placenta jar from the Joseon Dynasty consists of an outer jar with total height of 30.9 cm, mouth diameter of 21.4 cm, and bottom diameter of 14.1 cm as well as the inner jar whose total height is 19.2 cm, mouth diameter is 10.6 cm, and bottom diameter is 8.3 cm. The stone tablet bearing birth information and which was buried along with the placenta jar measures 26.6 cm by 26.7 cm by 4.6 cm. A placenta jar was used for holding the placenta of a prince or a princess. A stone tablet containing information on the name and birth date of the newborn baby was also buried along with the jar. The mouth of the outer jar is wide and is opened outward. The jar has a short neck and a body that gradually narrows toward the base. Four loops are attached to the shoulder of the jar and can be connected to the four holes on the knob attached to the lid -- which looks like that of a cooking pot -- for fastening the jar. The entire surface of the jar is evenly coated with white glaze, making the jar look glossy. 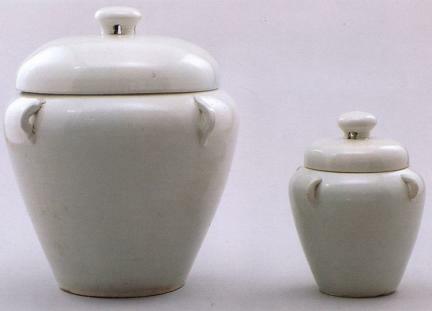 The inner jar has almost the same shape as that of the outer one, but slightly smaller. The stone tablet is made of square-shaped black stone. The inscriptions on the front and back sides of the tablet state that the jar was made in 1643, that it contains the placenta of Prince Aji, who was born in 1639, and that it was buried in 1643.